One of the largest construction events in Asia, Bauma China, took place between 27 – 30 November and attracted tens of thousands of visitors and exhibitors from across the globe. 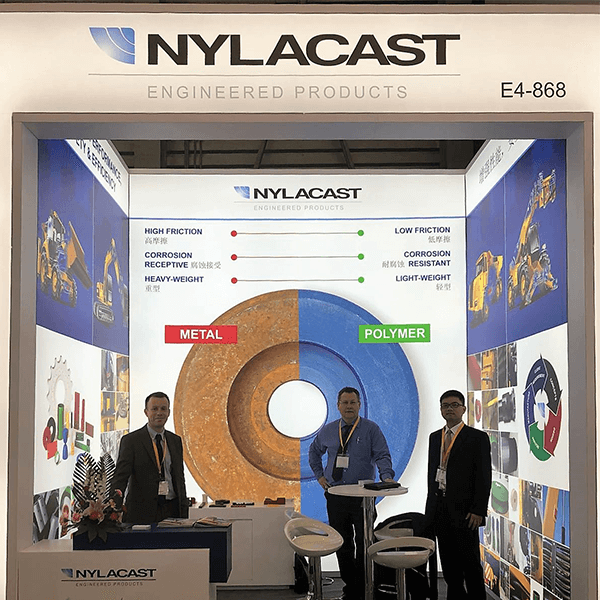 Nylacast’s sales and engineering team from the UK and China were present at the event, showcasing a leading range of award winning materials technologies and components. Widely used across the construction equipment sector by OEM’s, these solutions are proven to increase overall product efficiency and performance. The environmental and efficiency benefits also lead to longer machine running time with reduced need for maintenance and replacement of safety critical parts including wear parts and bearings. With the ability to manufacture custom components from raw chemistry, along with established manufacturing and supply chains in the UK and China, Nylacast are able to meet specific project needs from a variety of equipment manufacturers including earthmoving equipment, lifting equipment and powered access to name but a few.